ENED is located in Boca Chica, a poor neighborhood close to the Dominican capital of Santo Domingo. 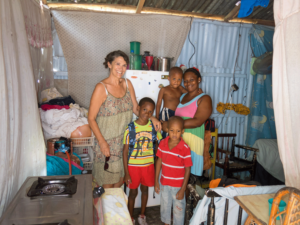 In October 2001 Jaclyn Krieg opened her first foster home with her own means in order to welcome two street children in Boca Chica near Santo Domingo. Several years later a second home was rented nearby for the older boys. Around 30 boys are now cared for by ENED in these two homes. To ensure the long-term existence of the homes, Jaclyne Krieg created the association called ENED (Entre Nous Et Demain, Between Us and Tomorrow). Individuals, associations, companies and clubs have joined this solidarity chain and are making a contribution to fund these two homes through donations and sponsorships. Over time, ENED has earned the confidence of the local community and also of the Dominican government. ENED is legally registered and accredited by CONANI, the Dominican Ministry of Child Welfare. ENED – how to give the most unfortunate children a choice. The destiny of street children in the Dominican Republic seems often predetermined: left on their own, without any legal registration, they are threatened by petty crime, drugs, prostitution, gangs and prison. ENED aims at helping those children to become responsible adults. To make it possible, ENED provides a home where the children receive food, shelter, clothing, health care and above all, love and education.